Jesse Boring was born circa 5 December 1807 in Shiloh, Jackson County, Georgia. He married Harriet Eveline Howard, daughter of Nicholas Howard and Judith Campbell, on 26 October 1833 in Columbus, Meriwether County, Georgia. The following appeared on 18 December 1849 in the Springfield, Illinois, Daily Register: The Methodist Episcopal Church, south, have appointed three missionaries for California--the Rev. Jesse Boring, D. D., Rev. 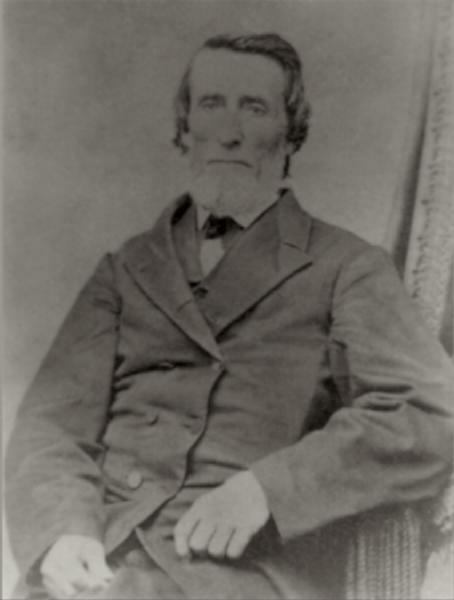 A. Wynn, of the Georgia Conference, and Rev. D. W. Pollock, of the St. Louis Conference. The following appeared on 9 March 1850 in the Boston American Traveller: The Rev. Jesse Boring and his colleagues, Messrs. Pollock and Wynn, were in New Orleans on the 25th ult., to take passage to California, to commence a mission under the direction of the M. E. Church south. The following appeared on 31 May 1850 in the Richmond Whig & Public Advertiser: Arrivals in San Francisco.--We notice among the arrivals at the St. Francis Hotel on the 15th ult. the names of Rev. Jesse Boring, Superintendent of the Methodist E. Mission, South; Rev. A. M. Wyman, Georgia; Rev. D. W. Pollock, Missouri; with their assistant colleagues, Mrs. Harriet E. Boring, Miss Julia M. Boring, Miss Ella C. Boring, Sarah J. Boring, Adelaide Boring, Master John H. Boring, Mrs. Maria C. Wyman, Georgia; Mrs. Rhodes, North Carolina. Jesse Boring and Harriet Eveline Howard appeared in the US federal census of 1 June 1860 in San Antonio, Bexar County, Texas, but it should be noted that it is an educated guess that John K. Boring is a member of this household.. Other members of the household included John Keener Boring, Sarah J. Boring, Adelaide H. Boring, Isaac A. Boring and Jesse Boring. He was a Methodist Episcopal minister, according to the 1860 census. The following appeared on 16 June 1864 in the Daily Columbus Enquirer: Dr. Jesse Boring.--A letter has been received from this gentleman, from Richmond, Texas, in which he reports himself to be in good health. Dr. Boring has held the position of Chief Surgeon in the Confederate army in Texas since the commencement of the war, until just before his letter was written. He speaks cheeringly of our prospects out there, and says provisions are plentiful. He states that great revivals are in progress in Texas, especially n the army. We take great pleasure in making this mention of Dr. Boring, as it corrects the impression which is abroad that he is dead. The following appeared on 20 May 1866 in The Daily Picayune: A new Methodist church is to built in Galveston. The new society will be ministered to by Rev. Jesse Boring, D.D., one of the ablest clergymen and deservedly most popular gentleman in the country. Jesse Boring and Harriet Eveline Howard appeared in the US federal census of 1 June 1870 in Atlanta, Fulton County, Georgia. Other members of the household included Sarah J. Boring, Adelaide H. Boring, Isaac A. Boring and Jesse Boring. He was a physician, according to the 1870 census. The following appeared on 15 October 1971 in The Marietta Daily Journal: One hundred years of ministry to children at the United Methodist Children's Home in Decatur will be emphasized with a special program 5:30 p.m. Sunday at St. Philip United Methodist Church in Marietta. . . .
North Georgia Methodists sponsor the home which began at Norcross on April 26 1871. The driving force behind its establishment was Dr. Jesse Boring. It became the first children's home of any kind in North Georgia. The Norcross campus was destroyed by fire in 1873 and 240 acres near Decatur were purchased for $6,000 then. In 1934 the name was changed from Methodist Orphan's Home to Children's Home to recognize the fact that it serves all types of neglected and dependent children. More than 3,000 children have been cared for during the 100 years of its cristency. One hundred children at a time can be cared for and all are over six years old. Higher education is paid for jointly by the home and through work by the student. . . . The following appeared on 8 June 1873 in The Advertiser & Republican: Rev. Dr. Jesse Boring has gained his suit against the Western road, of Alabama, for $10,000 damages. In 1871 the plaintiff was seriously injured at Opelika by falling or stepping into an uncovered ditch, and is crippled for life. Jesse Boring became a widower at the January 1879 death of his wife Harriet Eveline Howard. He married Harriet M. Ross on 16 March 1881. The following appeared on 17 March 1881 in The Macon Telegraph & Messenger: The Rev. Jesse Boring, D.D., presiding elder of the Atlanta district of the North Georgia Conference, an eminent divine who is well known throughout Georgia, was united by Bishop George F. Pierce, Wednesday, the 16th, in marriage with Mrs. Harriet M. Colquitt, the widow of Hon. Walter T. Colquitt, and stepmother of the governor. The marriage took place at the Executive Mansion in the presence of a few friends, and the married party went in afternoon train to Oxford, where they will reside. They have our cordial congratualtions and best wishes. Jesse Boring became a widower at the September 1889 death of his wife Harriet M. Ross. Jesse Boring died on 29 January 1890 in Dixie, Brooks County, Georgia, near Quitman. He was interred at Methodist Children's Home, Decatur, DeKalb County, Georgia. The following appeared on 1 February 1890 in The Macon Telegraph: Rev. Jesse Boring, D.D., who died near Quitman, last Wednesday night, was for many years a conspicuous figure in the Methodist Church. He entered the ministry of that church in 1826, and for more than half a century was one of the most active workers for the promotion of Methodism. Several years ago he was placed on the superannuated list, but he continued to labor as best he could to the last for the church he loved so well. In his prime Dr. Boring was famous as one of the most eloquent preachers of the day. There are thousands of people in Georgia who remember how he swayed multitudes as he preached with convincting power. He was a contemporary of Bishop Ahndrew, Bishop Capers, Bishop Bascom and Dr. Lovick Pierce, the men who did so much to lay the foundstions of the great strength of the Methodist Church in the South. Dr. Boring was an earlest, faithful man, as well as a gifted one. After a long life of labor and trials he rests well.